If it seems like the requirements for Handicap Parking are constantly changing, it's because they are. As a property owner or manager, you find a new tenant wants to move in and make a slight modification to their unit that requires a city permit. 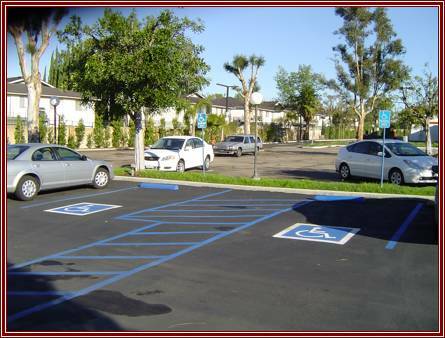 The next thing you know is the city is requiring the handicap stalls in the parking lot be brought up to existing code. Not to worry! 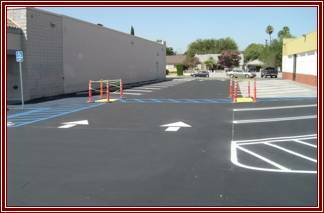 We are able to provide you with the complete service needed to bring your handicap parking stalls into compliance ranging from anything as simple as replacing a missing sign to leveling the asphalt area for the stalls to fall within the required 2% slope. 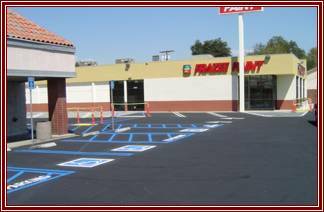 Frazee Paint handicap parking stalls. Frazee Paint handicap path of travel. Palm Garden Hotel stalls & path of travel. to service all your handicap parking needs. Call us or ► Click Here.